This complete kit provides you with a lesson book and all the tools you'll need to get started drawing now. The 24-page lesson book includes fundamental topics such as hand positions, strokes, value perspective, highlight and shadow. 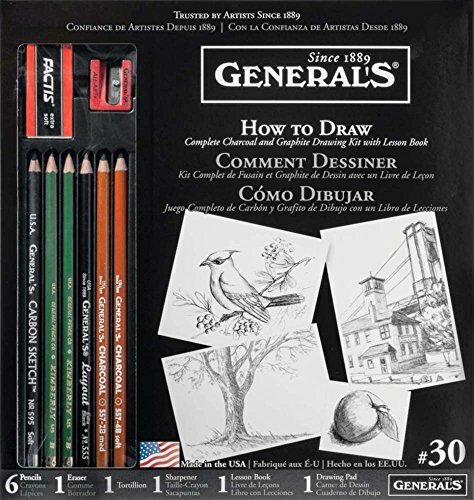 The kit also includes step-by-step techniques for still life, animal, figure drawing and cartooning. A 20-sheet drawing pad, three Kimberly graphite pencils, two charcoal pencils, a soft black Layout pencil, a blending stump, sharpener and a vinyl eraser complete this bountiful kit. Made in USA. This kit provides you with a lesson book and all the tools you'll need to get started. Farquar Camera Lucida New Lucida Original Drawing Tool Aid for Artist Teacher,Art Schools,Project an Image & Draw FUN Easy to USE- Makes a Great Gift for Any Artist!